oh goodness pebble, the suspense is just killing me. when are you going to arrive? i think i’ve hit a bit of a melting point. i just want you to be here. i want to be done carrying you on the inside. i want to hold you. 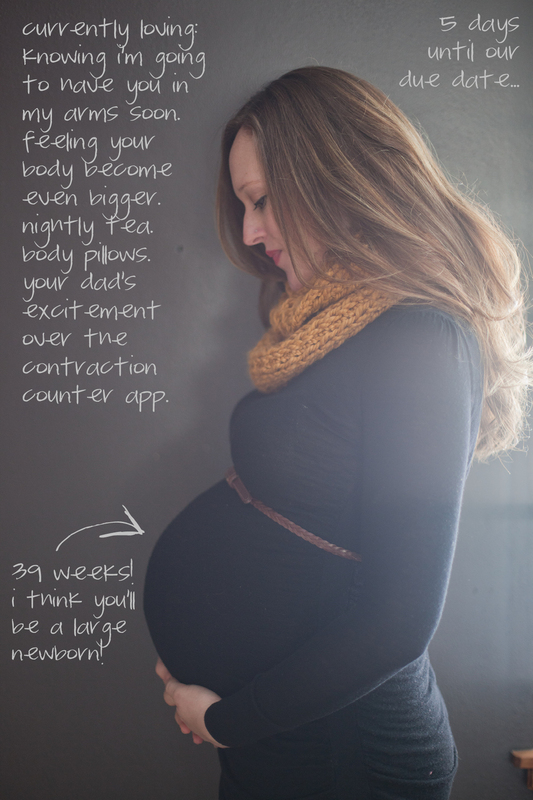 i loved my contraction counter app. ha! I still have the contractions on there from Grant! Good luck in the last week(ish). it is definitely the hardest time to wait! nate keeps on asking me if he can use it yet, he’s so excited 🙂 it is so hard to wait! 5 more days!!!! I’m so excited for you guys! Can’t wait to see the little guy! You are as beautiful as ever! I know it’s so hard to wait…especially for your first! AA was 10 days late! Here is a little advice: Cherish each of these last moments of this pregnancy! Enjoy your time with Nate! It is so precious! Sleep! Know that what you are about to embark (labor & delivery wise) has been done by millions of women! Remember, “you are fearfully and wonderfully made”! God designed women to carry, deliver & care for babies! You can do it! Can’t wait to see picts of little Pebble! Erin, those are wise, wise words!